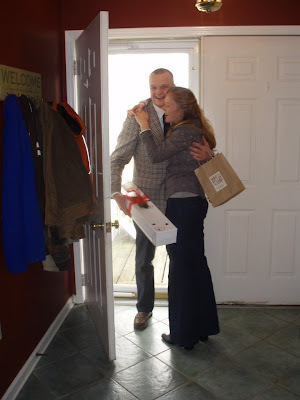 Isaac surprised Allie by returning home from vet school and appearing at her front door early Saturday morning with roses and chocolates! Allie was truly surprised and they were both so happy! They spent the day with Allie's extended family and ended the festivities with a special dinner at The Beekman Arms, the oldest inn in America. Isaac had been plotting this surprise for a while and had been counting down the days until he could leave vet school to be with his favorite person in the whole world!